Let’s start at the end and work backwards.. 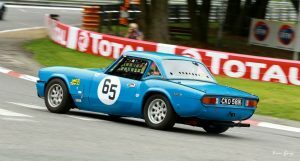 The year is 2018 and the image below is of my Triumph Spitfire competing (albeit badly, due to a blocked carb) at this years’ Pau Historic Grand Prix. Just after the turn of the millennium I decided to turn my then road-going Spitfire into a racing car. I succeeded and I learned a lot. Since those days I have lived in 3 different countries and speak a different language at work. Other than that not much has changed. Now that I have the site back I’m going to start by re-posting the original content of my old blog(s) and then I’ll add more up to date content including current and future events. If I run out of things to talk about I will post updates to the old content, most of it is wonderfully naive and I honestly don’t think I’d ever have started this if I knew then what I know now.